If you don’t mind, I’d like to state several obvious things and pass it off as “useful tips” in case you have nothing better to do this evening. But first: at Motherboard, a contemplation about the early days of digital photography and storage. The pictures these cameras took are, and will forever be terrible. And we saved them on our desktop behemoths with Pentium II processors and burned them onto CD-Rs that we bought from CVS in spindles of 50 or 100 for a couple nickels a pop. What were we thinking? That we were saving the images for future reference? It’s possible. I was recently going through some old things, and I came across damaged CD-R after damaged CD-R—many without even a sharpie-marked label, but many more with things like “PHOTOS-NEW YORK TRIP” written on it. Problem is, unlike the film photos I found laying around—from the early 90s, the 80s, some of them from my parents from even before that—I have no idea what these photos even look like. I don’t have a CD-drive anymore. Obviously, I’m overstating the problem a bit. Lots of people shot digital and film and backed up their things responsibly. Not everyone was a dumb high schooler who thought every little thing could be tossed onto a CD-R, and then, into a shoebox for safekeeping. And we’ll just leave it there. The “but” is the justification for writing the piece in the first place, which is: tech changes, so, how will we preserve our memories if we store them on things that might go out of style? Of course that has occurred to you, but there’s more. At the end of the year I go through all the photos for the past twelve months and make sure they have descriptive names like “Last Day of School 01.jpg”, and then I compress them into an archive and store it on DVD, on another hard drive, and in the cloud. Then I winnow out the best and sent them to a place that prints them into a book. The chances of anyone ever going through 1000 photos are slim; the chances someone in the family will page through the book some day - next year, ten years away - are high. Or fat, if you want to keep the figures of speech consistent. Since it’s a pain to do it all at the end of the year, I’ve decided that this year I will do it every day, so I’m always on top of the gargantuan data-wad of dog pictures, nature shots, building-site progress, and so on. So far so good; all the photos are in order, and the duds already winnowed out. It’s like the resolution people make to take a picture every day, which always peters out around February. I expect I’ll abandon this resolution around then as well, and wish I wasn’t A) compelled to take a picture of everything, and B) such a packrat when it came to computer files. 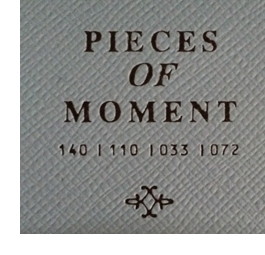 Makes me envious of my daughter, who takes Polaroids and puts them in a book called PIECES OF MOMENT. Made in China, where perhaps the creative team didn’t run the name past a native English speaker.